中村大 ■□■ バンド " BANK "、 " Vacation Three "、ソロ・ユニット " NUBACK " などで活動中 ■□■　I am a musician,song writer,living in Tokyo. My current bands(moniker) are NUBACK,BANK,Vacation Three and more. 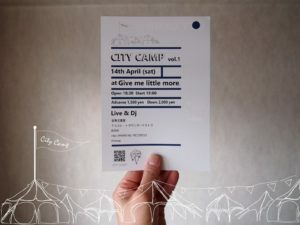 『City Camp vol.1』 4/14（土）長野・松本 Give me little more. 4/14（土）長野・松本 Give me little more.